Why should you order your own bridesmaid & maid of honor wine bottle labels? BONUS - 6 x's Kraft Bridesmaid Labels + 1 x Maid of Honor Label are included with each order. Our wine bottle labels are the perfect addition to your bridal shower, bachelorette party, engagement party and bride to be celebration. · 6 x's Kraft Label "I can't say I do without you! Will you be my bridesmaid?" · 1 x Rustic Kraft Label "I can't say I do without you! Will you be my maid of honor?" 100% MONEY BACK GUARANTEE - so your purchase is TOTALLY RISK FREE! © HADLEY DESIGNS. Original design by HADLEY DESIGNS ®. All rights reserved. Exclusive one of a kind design. 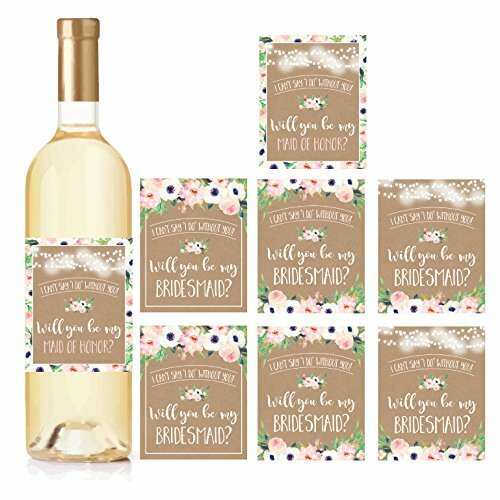 THE BEST BRIDESMAID & MAID OF HONOR WINE LABELS - Each order includes 7 high quality Custom Wine Bottle Labels. The perfect wedding gifts for bridesmaids or maid or honor gifts. WATERPROOF & DURABLE - Each label is printed on high quality waterproof material MADE IN USA. Serve refrigerated or in ice! Will be my bridesmaid! 100% MONEY BACK GUARANTEE - If you aren't satisfied with your purchase or have any questions/concerns please do not hesitate to contact us, we are here to help you. If you aren't happy with your purchase we offer a 100% MONEY BACK GUARANTEE, so your purchase is TOTALLY RISK FREE!